UI-related context points to an element that will be shown on the page on a right mouse click. 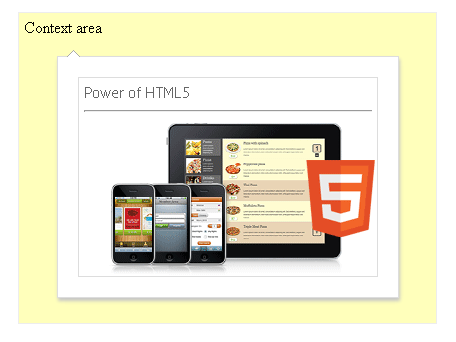 The context looks like a popup window where you can place any HTML element or UI component. padding - the offset from the context border and its inner contents. Context features the hidden property set to true by default. It can be changed during the component's initialization, but this won't make much sense as the purpose of context is to be hidden and appear only on a right click. What can be used as a context element? The ID is specified in the body constructor as a value of the content property. Content will get elements that are inside the container.